For the other community formerly known as Georgetown, Kentucky, see Fairview, Christian County, Kentucky. Georgetown is a 4th-class city in Scott County, Kentucky, in the United States. The 2013 population was 30,872 per the United States Census Bureau. It is the 9th-largest city by population in the U.S. state of Kentucky. It is the seat of its county. It was originally called Lebanon when founded by Rev. Elijah Craig and was renamed in 1790 in honor of President George Washington. It is the home of Georgetown College, a private liberal arts college. 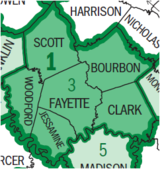 Georgetown is part of the Lexington-Fayette, KY Metropolitan Statistical Area. The city's growth began in the mid-1980s, when Toyota built Toyota Motor Manufacturing Kentucky, its first wholly owned United States plant, in the city. The plant, which currently builds the Camry, Camry Hybrid, Venza, and Avalon automobiles, and will build the Lexus ES beginning in 2015, opened in 1988. It is the largest building in terms of acres covered under one building in the United States, with over 200 acres (0.8 km2) occupied. The city previously served as the training camp for the NFL's Cincinnati Bengals. Native peoples have lived along the banks of Elkhorn Creek in what is now Scott County for at least 15,000 years. European exploration can be dated to a June 1774 surveying expedition from Fincastle County, Virginia, led by Colonel John Floyd. For his military service, he was granted a claim of 1,000 acres (4.0 km2) in the area by the state of Virginia. He named it Royal Spring but did not settle it. John McClellan was the first to settle the area and established McClellan's Station there in 1775, but the compound was abandoned following an Indian attack on December 29, 1776. In 1782, the Baptist preacher Elijah Craig led his congregation to the site and established a new settlement which he called Lebanon. This was incorporated by the Virginia legislature in 1784. Craig established some of the first mills west of the Appalachian Mountains along the Royal Spring Branch, manufacturing cloth and paper. He also founded a distillery in 1789, as well as a school called the Rittenhouse Academy. This eventually grew into Georgetown College. The city's name was changed to George Town in honor of President George Washington in 1790. When Kentucky became the 15th U.S. state in 1792 and formed Scott County, George Town became its seat of government. The name was formally changed to Georgetown in 1846. During the Civil War, Georgetown was raided by Confederate Gen. John Hunt Morgan twice, once on July 15, 1862, and the second time on July 10, 1864. Following the war, the town became a railroad hub, connected to the Cincinnati Southern, the Louisville Southern, and the Frankfort & Cincinnati. The last was considered the "whiskey route" and brought much of the region's bourbon to market. From 1896 to 1987, the Cardome Centre site was the location of a girl's academy founded by the Sisters of Visitation. It now serves as a community center for the city of Georgetown. Throughout the 20th century, Georgetown has been in transition from an economy based primarily on agriculture, to a diversified one mixing manufacturing, small business, and the family farm. During the 1960s, the construction of Interstate 75 placed the city on one of the busiest highways in America. The selection of Georgetown as the site of Toyota Motor Manufacturing Kentucky in 1985 has resulted in the greatest period of growth in the city's history. The historic Ward Hall, now the home of The Ward Hall Preservation Foundation, is located just outside of Georgetown. Ward Hall was the summer home of Junius Ward. The home represents the height of the Greek Revival period of architecture in Kentucky. The Georgetown business section has a historic district known as the Oxford Historic District. Georgetown is located at 38°12′52″N 84°33′20″W﻿ / ﻿38.21444, -84.55556 (38.214542, -84.555496). According to the United States Census Bureau, the city has a total area of 15.85 square miles (41 km2), all land. As of the 2010 Census, there were 29,098 people 10,733 households, and 7,452 families residing in the city. The population density was 1,836.4 per square mile (709.0 /km2). There were 11,957 housing units. The racial makeup of the city was 87.5% White, 7.0% African American, 0.3% Native American, 1.2% Asian, 0.0% Pacific Islander, 1.9% from other races, and 2.1% from two or more races. Hispanics or Latinos of any race were 4.3% of the population. According to the 2010 census, Georgetown is Kentucky's ninth largest city. There were 10,733 households out of which 38.1% had children under the age of 18 living with them, 49.6% were married couples living together, 14.9% had a female householder with no husband present, and 30.6% were non-families. 24.9% of all households were made up of individuals and 6.6% had someone living alone who was 65 years of age or older. The average household size was 2.59 and the average family size was 3.09. The age distribution was 27.9% under 18 and 8.3% who were 65 or older. The median age was 31.7 years. The median income for a household in the city was $51,692. The per capita income for the city was $24,376. About 13.9% of the population was below the poverty line. Giddings Hall on campus of Georgetown College in Georgetown, Kentucky. Georgetown College is a private liberal arts college located in the downtown area of Georgetown. Public education in Georgetown and Scott County consists of eight elementary schools (grades K-5), three middle schools (grades 6-8) and one high school (grades 9-12). These twelve schools are all part of the Scott County School system. Plans have been in progress for an additional high school and middle school within the city limits for several years due to the expanding population. Scott County High School also houses a separate (though still attached) wing for students in the ninth grade, called the Ninth Grade Center, which was developed to ease the transition for students between middle school and high school. An extended campus of the high school, Elkhorn Crossing School, provides some sophomores and juniors with a curriculum that integrates academic and career-based disciplines. Another unique feature, the Alternative School, is also part of the Scott County High School educational complex. The Alternative School strives to educate students who may have difficulties in a normal classroom setting (for example, those with disciplinary or other concerns). Private education in Georgetown and Scott County includes St. John elementary and middle school, Providence Christian Academy elementary and middle school, and Keystone Montessori elementary school. UK HealthCare and Baptist Health Lexington have regional campuses in Georgetown. Georgetown also has many nursing facilities, including Signature HealthCARE of Georgetown, Windsor Gardens Retirement Community, and Dover Manor Nursing Home. Georgetown's newspaper, the Georgetown News-Graphic, prints on Tuesday, Thursday, and Saturday. Residents of the area commonly subscribe to this locally-geared newspaper in addition to the larger Lexington daily newspaper, the Lexington Herald-Leader. Royal Spring, the main source of water for Georgetown, Kentucky since the earliest settlement as McClelland's Station in 1775. Benjamin Franklin Bradley - politician, representative to the Confederate States Congress from Kentucky. Born in Georgetown in 1825. Stephen G. Burbridge - U.S. Army major general during the Civil War. Born in Georgetown in 1831. J. Campbell Cantrill - politician, U.S. Representative from Kentucky. Born in Georgetown in 1870. Elijah Craig, early Baptist preacher, educator and entrepreneur. Worked on protecting religious freedom with James Madison of Virginia. Basil W. Duke - lawyer and Confederate general officer during the Civil War. Born in Georgetown in 1838. William H. Hatch - politician, U.S. Representative from Missouri. Born in Georgetown in 1833. Tom L. Johnson - U.S. Representative from Ohio 1891-95, Mayor of Cleveland 1901-1909. Born in Georgetown in 1854. Dallas Robinson - 2014 Olympian-soldier. Sole Olympian from Kentucky in the Sochi Russia Games. James F. Robinson - politician, 22nd Governor of Kentucky. Federal Governor during the Civil War. Cardome in Georgetown was his family home. John McCracken Robinson - politician, United States Senator from Illinois. Born in Georgetown in 1794. Gustavus W. Smith - General in the Confederate Army during the Civil War; Confederate Secretary of War in 1862. ^ Georgetown, Kentucky Kentucky Secretary of State: Land Office. Retrieved 2013-08-23. ^ a b c d e Kentucky Encyclopedia, p. 371. "Georgetown". University Press of Kentucky (Lexington), 1992. Accessed 26 Jul 2013. ^ City of Georgetown. "History of Georgetown & Scott County". Accessed 15 May 2013. ^ Cardome Center. "About" and "History". ^ "Monthly Averages for Georgetown KY". The Weather Channel. http://www.weather.com/outlook/events/sports/wxclimatology/monthly/40324. ^ a b c "State & County QuickFacts: Georgetown (city), Kentucky". U.S. Census Bureau. Retrieved 2013-08-29. ^ "Crime in Kentucky". Kentucky State Police. http://kentuckystatepolice.org/pdf/cik_2013.pdf. Retrieved 2014-07-17. ^ Georgetown News-Graphic URL accessed on 05/13/2013. Wikisource has the text of a 1911 Encyclopædia Britannica article about Georgetown, Kentucky. This page uses content from the English language Wikipedia. The original content was at Georgetown, Kentucky. The list of authors can be seen in the page history. As with this Familypedia wiki, the content of Wikipedia is available under the Creative Commons License.